Biological safety testing can be defined as knowledge, techniques and equipment to prevent personal, laboratory and environmental exposure to potentially infectious agents or biohazards. The major objective is to reduce the potential exposure of the laboratory worker, persons outside of the laboratory, and the environment to potentially infectious agents. Globally increasing instance of chronic diseases and growing biopharmaceutical industry is expected to remain key growth driver for the biological safety testing market during the period of study. This report identifies the global biological safety testing market size in for the year 2015-2017, and forecast of the same for year 2022. 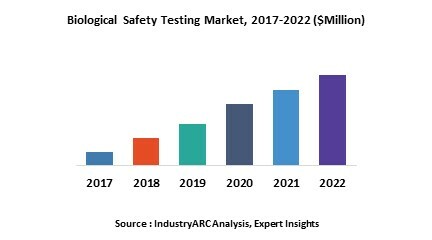 It also highlights the potential growth opportunities in the coming years, while also reviewing the market drivers, restraints, growth indicators, challenges, market dynamics, competitive landscape, and other key aspects with respect to global biological safety testing market. Geographically North America dominated the global biological safety testing market owing to developed healthcare infrastructure with standard guidelines & procedures, presence of global bio tech companies and pharmaceutical players and higher investment into R& activities in the region. North America was followed by Europe and Asia-Pacific as the second and third largest markets for biological safety testing. However Asia-Pacific is expected to remain the fastest growing market during the period of study driven by economic developments, developing healthcare infrastructure in the major economies such as India and China. 15.2. Thermo Fisher Scientific Inc.